There is a long-standing choral tradition at St Peter’s, developed by musicians such as Vincent Trivett (Organist, 1906-1947) and Kendrick Partington (Organist, 1957-1994). Today, the choir can be heard singing in church every Sunday, and in frequent concert performances. As well as singing at St Peter’s throughout the year, the choir often sings in churches and cathedrals across the UK and abroad. Particularly noteworthy visits of recent years have included those to Paris, Cologne, Westminster Abbey and many of the UK’s major cathedrals. 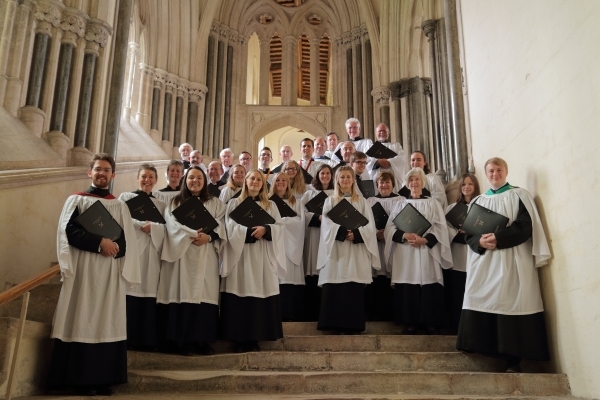 The choir tackles a broad range of repertoire from plainsong and renaissance polyphony to Romantic and contemporary works from across the world. St Peter’s employs a professional musician as Organist & Director of Music, and the membership of the choir combines a number of students and recent graduates from the city’s two universities with volunteer singers from around the city and county. Though an amateur ensemble, the choir produces what the Nottingham Evening Post has termed an “outstanding standard of music-making”, thanks to the commitment and hard work of its members. The current Organist & Director of Music is Dr Peter Siepmann, who is assisted by a team of assistant organists. Further news from the choir can be found on Facebook and Twitter. A selection of audio recordings of St Peter’s Choir can be found here. 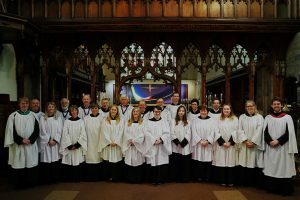 As well as singing at St Peter’s throughout the year (and once a month at the sister church of All Saints on Raleigh Street), the choir often sings in churches and cathedrals across the UK and abroad. The first such visit was to Lichfield Cathedral during Easter Week 1969. St Peter’s is proud to maintain a choral presence in church all year round, though of course students are only expected during term time. In addition to these routine services, there are also a number of special services on certain feast days (Christmas Eve, Christmas Day, Ash Wednesday, Maundy Thursday, Easter Day, etc.) as well as regular trips to cathedrals both in the UK and abroad, and frequent concert performances. All singers are heartily encouraged to take full advantage of all of these wonderful opportunities! A termly schedule is published by the Director of Music, and singers are asked to give as much notice as possible of any planned absence using a user-friendly online system. Students in higher education are offered a scholarship of £300 p/a. Students in secondary education are offered a scholarship of £200 p/a. After one year’s service, secondary students are eligible to apply, should they wish, for financial help with music tuition from the Vincent Trivett Fund – a trust established by a former Organist of St Peter’s. Scholarships are appropriate for all voice parts but are subject to availability of places and funding. We also often an organ scholarship of £450 p/a for students in higher education. For details please contact the Director of Music via the Parish Office. Please contact the Parish Office for details of any events or to get in touch with a member of staff. All correspondence should be sent to the Parish Office (not to All Saints’ or St Peter’s church). The office is situated on the upper floor of the St Peter's Centre, on the south side of St Peter's Church and adjacent to Marks & Spencers. If you wish to trace a former resident or member of the parish, please address your requests to the Nottinghamshire Archives. For information on service times at All Saints' & St Peter's, please visit the Services page. Disabled/Pushchair access to St Peter's Church is possible via the North Door, which can be accessed by a path running along the side of the church (off St Peter's Gate, by St Peter's Church Walk).